The renowned Islamabad based theatre group, KopyKat Productions has once again collaborated with veteran playwright Anwar Maqsood and director Dawar Mehmood to bring to audiences a play on Siachen. Exclusively sponsored by Mobilink, the play narrates the story of soldiers posted on the highest battleground in the world. The Islamabad premiere of ‘Siachen’ will take place on the 29th October, 2015 with the last show scheduled for 19th November, 2015. More than half the shows have already been pre- booked, the remaining are gaining fast interest through social media, word of mouth and mainstream marketing. Based on the lives of soldiers posted upon the disputed glacier, ‘Siachen’ is set in 2016, a time when tensions between the two neighboring countries has dwindled away and peace might be on the horizon. The play is a compilation of multiple short stories experienced by the soldiers over a period of six months. These stories include an entire unit waiting for their goat on Eid-ul-Adha, a love triangle between a Captain, soldier and the journalist, a Behari soldier made prisoner of war by the Pakistani camp, and anticipation between the two groups of soldiers for the upcoming Indo-Pak T20 cricket match on the radio. Legendary playwright, Anwar Maqsood has penned this play to depict the much lighter side of the conflict between two nations usually known for excessive hostilities towards each other across mainstream media. The preparations for ‘Siachen’ are probably the most intense for any theatre play Pakistan has ever witnessed, and with a 3D set, the house arrest and a huge number of cast members, this play is the biggest local theatrical production ever. Said Aamir Ibrahim, Deputy CEO and CCO – Mobilink. Tickets are now available for sale with details on facebook.com/kopykatsproductions. 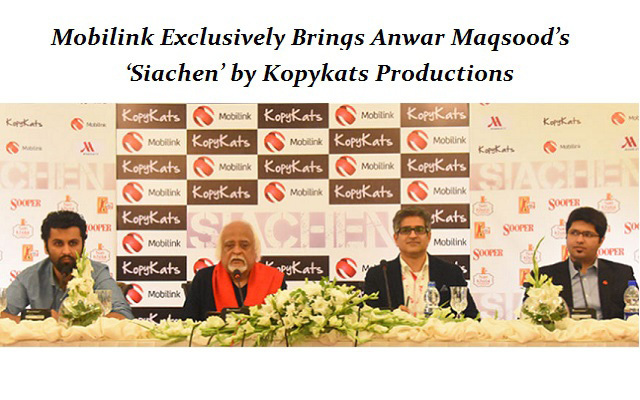 In the past, Kopykats Productions and Anwar Maqsood have respectively produced and written successful plays i.e. ‘Pawney 14th August’, ‘Sawa 14th August’, ‘Aangan Terah’, ‘Dharna’ and ‘Half Plate’.